The new climate accord represents the triumph of realistic, bottom-up thinking over elegant but unworkable top-down solutions. Here’s how a deal hatched in Warsaw two years ago opened the possibility of forging a global deal that includes both market mechanisms and ‘Mother Earth’. 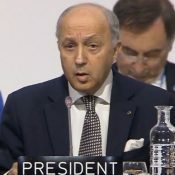 15 December 2015 | When French Foreign Minister Laurent Fabius banged his little green gavel on Saturday to signal the adoption of the Paris Climate Accord, he also took a decisive whack at an illusion that has done almost as much to stifle climate action as climate-science denial has. It’s an illusion that features prominently in books like Naomi Klein’s This Changes Everything, and it’s explicitly delineated in the book’s subtitle (“Capitalism vs. The Climate”). My high-school philosophy teacher would call it a “false duality”, because it says that climate change is either a moral challenge or an economic one, when in fact, it’s both, and meeting the challenge one way doesn’t preclude meeting it the other. The illusion has stifled real progress on climate talks almost since they began in 1992, but it started losing its grip two years ago, on a frigid morning in Warsaw, when negotiators abandoned the quixotic quest for a one-size-fits-all, top-down agreement like the failed Kyoto Protocol and aimed instead for a global framework within which countries can embed their own unique climate action plans. Instead of dividing the nations of the world into three neat categories – developed, developing, and “in transition” – the new framework acknowledges that each country is unique, and that different philosophical approaches can be employed in pursuit of the same goal. It acknowledges that we need to fix the economic system, not destroy it, and it rejects the false duality between morality and markets, encouraging instead the development of moral markets that are well-structured, well-run, and well-regulated – and that every country is free to use or not use. It even blends scientific concepts like biodiversity and ecosystem integration with indigenous concepts like Mother Earth, who is explicitly mentioned in the preamble. The Agreement itself is just 31 pages long and contains only 29 articles, but each of those articles is either bolstered by hard-won decisions or lays out a process for achieving more decisions in the future. It’s a work of simple elegance worthy of James Joyce, and I’m not joking: change one word, and the whole thing crumbles. Let’s take just one article – Article 5 – which is the one dealing with forests and REDD+, a horrendous acronym that stands for “Reducing Emissions from Deforestation and forest Degradation” plus a slew of other activities related to sustainable land-use. Before diving in, you’ll need a quick primer on the history of REDD+ itself. REDD began percolating way back in the early 1970s, when physicist Freeman Dyson asked a simple question: “Can we control the carbon dioxide in the atmosphere” by planting trees that breathe in carbon dioxide and breathe out oxygen? His answer: yes, we can, but we’d still need to slash our industrial emissions to prevent catastrophic climate change. In the late 1980s, a policy analyst with the World Resources Institute named Mark Trexler realized you could sponge up even more carbon dioxide if you saved endangered rainforest rather than planting new trees, and the energy company Applied Energy Services (AES) worked with him to reduce their carbon footprint by doing just that. To measure the carbon, they used the same process that timber companies use to estimate the amount of wood in a forest: basically, measuring trees at chest-height and then applying “allometric equations” to see how much wood – and, by extrapolation, carbon – they contained. To determine which parts of the forest were in danger, they used a combination of econometric modeling and historic rates of deforestation (a process that was rudimentary at the time and resulted in over-counting, but which has been improved and refined over the years). Article 5 contains just two paragraphs, but those paragraphs refer to at least a dozen decisions and elements of other agreements, and the entire history of this extraordinary document is there if you know to look for it. Paragraph 1: Parties should take action to conserve and enhance, as appropriate, sinks and reservoirs of greenhouse gases as referred to in Article 4, paragraph 1(d), of the Convention, including forests. Paragraph 2: Parties are encouraged to take action to implement and support, including through results-based payments, the existing framework as set out in related guidance and decisions already agreed under the Convention for: policy approaches and positive incentives for activities relating to reducing emissions from deforestation and forest degradation, and the role of conservation, sustainable management of forests and enhancement of forest carbon stocks in developing countries; and alternative policy approaches, such as joint mitigation and adaptation approaches for the integral and sustainable management of forests, while reaffirming the importance of incentivizing, as appropriate, non-carbon benefits associated with such approaches. This is a mouthful, so let’s break it down. “Results-based payments,” means money, to be paid from one country to another based on the amount of extra carbon the receiving country keeps locked in forests as a result of actions that countries take to slow deforestation. These payments may be “market-based”, which means the country paying for them then gets to reduce its own emissions by the additional amount of carbon locked in trees, or they may be “non-market” based, in which case the country receiving the payment also gets credit for the emission-reduction achieved – but that is dealt with in Article 6. “The existing framework as set out in related guidance and decisions already agreed under the Convention,” refers to roughly a dozen decisions made over the years regarding the measurement of forests, the establishment of reference levels, and the role of indigenous people in preserving forests. “Activities relating to reducing emissions from deforestation and forest degradation” refers to REDD, but without mentioning the acronym directly, because it’s become a target for people with duality delusion syndrome. “The role of conservation, sustainable management of forests and enhancement of forest carbon stocks in developing countries; and alternative policy approaches, such as joint mitigation and adaptation approaches for the integral and sustainable management of forests,” is the “+” in “REDD+” – all the other land-use issues associated with farms and fields. “While reaffirming the importance of incentivizing, as appropriate, non-carbon benefits associated with such approaches,” refers to things like biodiversity and the protection of indigenous rights. The next article – Article 6 – is different from Article 5, because it deals more with the job to come than with the job completed. Specifically, it lays out a workplan for developing payments for performance that are either market-based or non-market based, or both. We’ll dive into this one later in the week, and shine a light on a process that’s sure to generate sparks in the year ahead – in part because it’s a complex issue with real challenges, but also because Fabius only took a whack at the illusion. He didn’t shatter it. How does REDD+ in the Paris Accords encourage moral markets when it does not require the recognition & enforcement of the resource tenure and human rights for Indigenous & forest communities? A well-regulated market requires clear ownership of resources, the rule of law & enforced human rights in order to fairly: trade, negotiate & litigate. These are fundamental principles necessary for a well-regulated & well-run market. So how does REDD+ in the Paris Accords (REDD) encourage moral markets that are well-regulated when it does not require the recognition & enforcement of resource tenure and human rights for Indigenous & forest communities prior to payment or funding? Mr, Zwick or your allies, if you read no further, please answer this question using the agreed REDD text & references. If the answer is not in the text, then what is your REDD strategy to ensure those rights are recognized & enforced? The key non-binding words there are, “…request…to address…” applied to the “…land tenure issues… forest governance…safeguards.” This is vague “UNese” language providing the dangerous illusion of safeguards that are not there. The fate of millions of forest peoples reside in the difference between enforcing resource & human rights vs addressing them. The world’s largest forests & their peoples primarily exist because these forests were not profitable to exploit due to inaccessibility or danger. REDD is creating an economic incentive to now make these forests & their peoples much more profitable to exploit but without the enforcement of the rights & safeguards that will protect them. Carbon credit entrepreneurs, Government entities & NGOs have already started pushing REDD into the last remote forests endangering some forest peoples. Jorge Furagaro Kuetgaje, climate coordinator for COICA, the Indigenous People of the Amazon Basin stated, “For us to continue to conserve the tropical forests … we need to have strong rights to those forests. Death should not be the price we pay for playing our part in preventing the emissions that fuel climate change.” A Global Witness report found that at least 116 environmental activists were murdered in 2014, and 40% of the victims were indigenous. How is REDD ethical, if it only is “requesting to address land tenure rights, forest governance & safeguards (read human rights) & ensuring participation” for marginalized traditional forest peoples? Would the Paris Accord negotiators & REDD promoters sign an agreement not to have their family’s property rights or human rights enforced but just request them to be addressed? Not to secure those rights prior to REDD funding or payment for marginalized people with minimal legal means & sophistication is unethical. “While reaffirming the importance of incentivizing, as appropriate, non-carbon benefits associated with such approaches,” refers to things like biodiversity and the protection of indigenous rights. Mr. Zwick, please explain exactly what binding protection this text provides for indigenous rights? As revealed here, many of REDD supporters at COP21 stopped using its’ 10 year old acronym & started referring to saving the forests to avoid REDD’s text from being scrutinized. Not all REDD’s critics have “duality delusion syndrome”, many of us support ethical markets. But REDD is ethically inadequate & needs to be based on the Golden Rule.